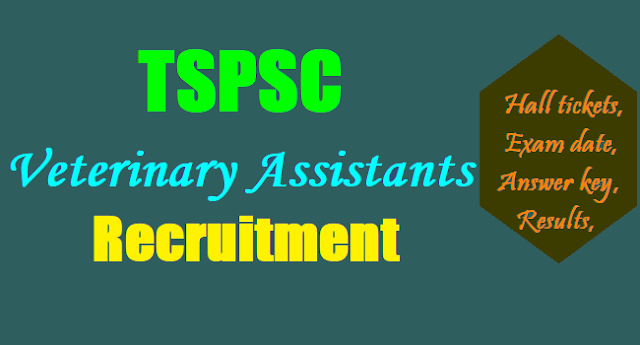 TSPSC to fill 541 Veterinary Assistant Posts in Animal Husbandry Department, Veterinary Assistant posts recruitment by TSPSC in Animal Husbandry Department: TSPSC VAs Recruitment, TSPSC Veterinary Assistants 2017 recruitment, TSPSC Veterinary Assistant posts Recruitment: TSPSC has released the 541 Veterinary Assistants Recruitment notification on June 1 and Online application forms are invited from the eligible and interested candidates for filling up the 541 Veterinary Assistant posts in Animal Husbandry Department. Interested and eligible candidates should prepare for applying for this recruitment and they should submit their online application through online mode at tspsc web portal. For more information regarding TS Veterinary Assistant Jobs 2017 details like Age limit, Selection procedure, how to apply, eligibility criteria details are given here for information purpose. G.O.Ms.No. 86 Dated19-05-2017: Government of Telangana given permission to fill by direct recruitment 541 in the category of Veterinary Assistant under the control of Director, Animal Husbandry, Department, Telangana, Hyderabad, through the Telangana State Public Service Commission. The Secretary, Telangana State Public Service Commission, Hyderabad shall take appropriate steps for filling the above vacancies through direct recruitment by obtaining the details, such as local cadre wise / vacancy position, roster points and qualifications etc., from the concerned authorities. The Secretary, Telangana State Public Service Commission, Hyderabad shall issue the notification and schedule for recruitment expeditiously. Age Limit: Applicants upper age limit should not be more than 40 years. Educational Qualification: Applicants should have passed polytechnic diploma in Animal Husbandry course from any recognized Institute/Board. Application fee: May be Rs.100/- for all category candidates. Application fee should be deposited through Demand draft in favour of concerned Joint Director (AH). Last date for submission of application form and Date of written Exam will be announced soon. TS Veterinary Assistant Posts 2017 in Animal Husbandry Department, Online Application Form, Written Exam Date, Hall Tickets, Results details will be provided soon time to time in this page.